Upon first glance, you might think that Dimension Drive is nothing more than another straight forward shoot-em-up., and you would only be partially right. While most of the time spent on this game does consist of the usual — blasting endless waves of baddies using a variety of weaponry — it does have an ace up its sleeve that might be enough reason not to sleep on this game. 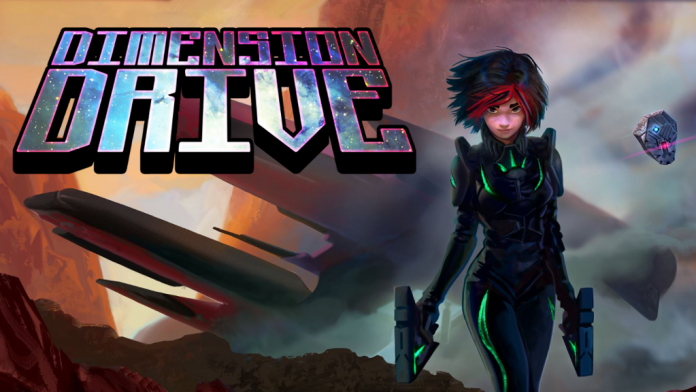 Initially released in 2017 on PC and Switch, Dimension Drive comes to the Xbox One and PS4, letting console players get a taste of its frenetic, multi-screened action. Players step into the shoes of Jackelyne Tywood, a young hotshot pilot who is the last of her race. With the help of her friendly A.I. V.E.R.A, it is up to Jack to stand up to the evil Ashajuls using her ship “The Manticore”. Dimension Drive certainly is not going to win any awards for the originality of its plot or the portrayal of its wafer-thin, archetypal characters. But where it does shine is both in the fun, fast gameplay requiring a player’s full attention and in the clean presentation. If you have played Galaga, Ikaruga or any other vertical shoot-em-up, you’ve already got a fairly good idea of what to expect. Enemies of various shapes and sizes descend from the top of the screen and it is your job to blast them to oblivion. 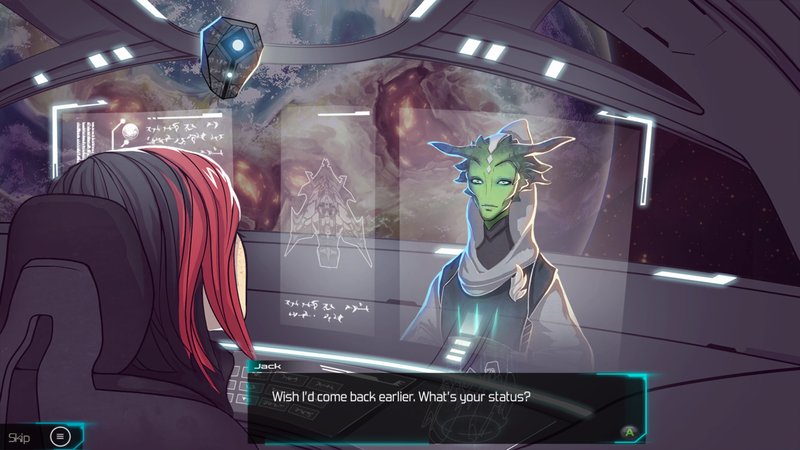 Where Dimension Drive strives to differentiate itself from the rest is through its eponymous gameplay feature. The Manticore is one of few ships in the galaxy which possess a Dimension Drive which allows The Manticore to hop between dimensions. This feature opens up a whole new world of gameplay possibilities that is taken advantage of at every opportunity. 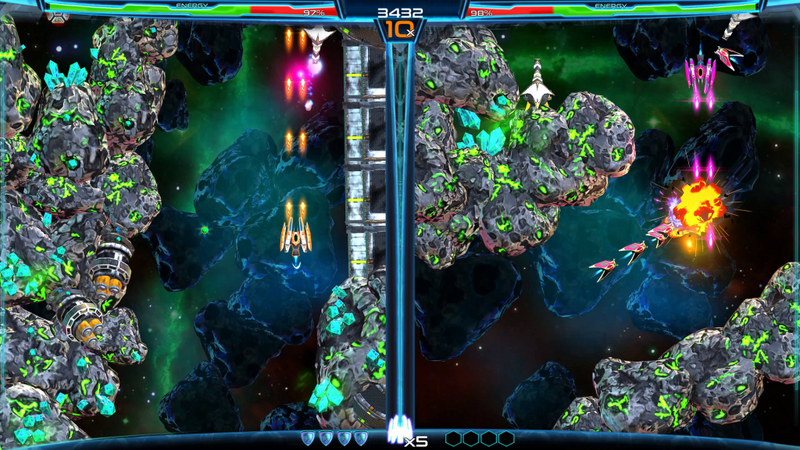 You might have noticed that gameplay is split up into two separate screens. 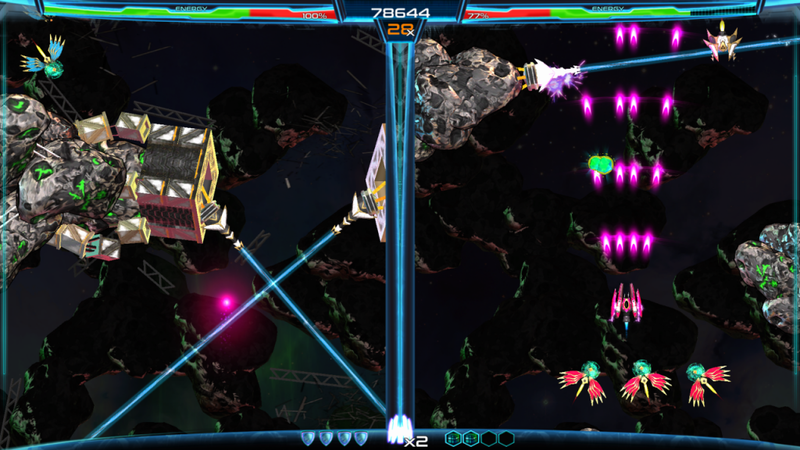 At the press of the button, the player’s ship teleports from one side of the screen to the other. Not only does this mean that the player has to be aware of everything happening on both screens, but it also allows for an interesting set of encounters and puzzle-like elements. A variety of enemies and environmental hazards blocking your path require careful navigation and teleportation skills to see it through unscathed. Itchy trigger fingers and razor-sharp reflexes will only get you so far in Dimension Drive; your wits, and quick thinking will carry you the rest of the way. While the main campaign may not be the meatiest, Dimension Drive encourages players to go back, replay levels and ultimately master them. Four difficulty levels ensure that even the most battle-hardened player will get a challenge. It also comes with both a New Game+ mode as well as a co-op campaign to keep the fun going into the wee hours of the night. Couch co-op has seemingly gone the way of the dodo bird recently so it is always nice to see a game with fun and chaotic gameplay to give us the chance to embrace the carnage with a friend. Dimension Drive’s overall presentation is silky smooth despite a few shortcomings that can be overlooked. The story is mostly told through beautifully hand-drawn cut scenes in between missions. The sometimes hokey voice acting can be forgiven as you don’t actually hear it that much and the responsive controls perfectly compliment the satisfying way you can fill up your screen with a litany of explosions. The enemy design is varied enough to not feel stale and the variety of weapons help make sure you never get bored blasting away. Level backgrounds are lovingly animated with enough contrast between background and foreground so players do not make any fatal mistakes because they couldn’t distinguish what is an obstacle and what is set dressing. Not to mention the array of different environments you’ll be fighting through. Players will be taken on a journey from the outer reaches of space, through asteroid fields, space stations and a few planets on their journey to defeat the Ashajuls. Dimension Drive succeeds in mixing things up enough and introducing new elements gradually to the player to ensure there is never a dull moment. Weapons sound as forceful as they look and the concussive thuds of enemy ships exploding feel satisfying. Overall, the sound design is well handled except for maybe one small caveat. The repetitive electronica-laced soundtrack overlaying the gameplay is exactly that; repetitive. The same beats and notes will reverberate through your brain for several hours playing this game. If you can manage that without going insane then there is some really great gameplay underneath. All in all, the challenging yet accessible gameplay of Dimension Drive overshadows the few problems I do have with it. The lackluster plot and repetitive soundtrack can be overlooked considering the excellent gameplay hook that will have you teleporting back and forth across the screen in a mad flurry to keep up with the action. Through in a good amount of replayability and a co-op mode, and you’ve got a great game to play with a friend. Fun gameplay and an interesting gimmick helps this shoot-em-up differentiate itself from the rest of the pack. Michael Wahba has lived in Calgary, AB his whole life where he graduated in Biology from the University of Calgary. Currently pursuing a degree in Computer Science, He is a firm advocate for the ability of video games to tell stories that no other medium can.